principles are followed without further ado. There are also other festivals with exemplary waste management such as Universo Paralello in Brazil. At the Universo biannually held on Bahia’s Pratigi Beach the contents of the toilets are collected in a watertight pit and removed by tank truck. The dancefloors are always clean and the bordering nature preserve underlies strict ruling. 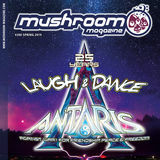 More and more organisers find it important to have a carefully considered ecological concept not just because it is demanded by the requirements of the authorities, but because it is an increasingly important principle of a good Psytrance festival. This kind of ecological understanding and behaviour should be naturally also to all fraggles on the dancefloor. accordance with stringent ecological criteria and has to fulfil certain requirements. Organic food, vegetarian dishes, local and fair-trade products are mandatory. 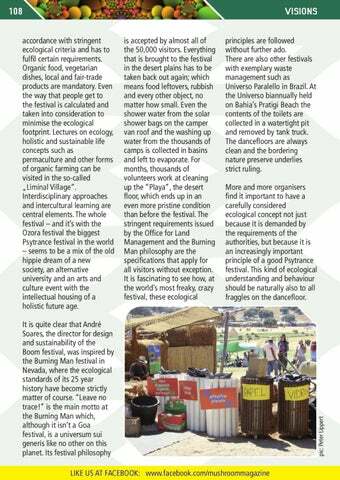 Even the way that people get to the festival is calculated and taken into consideration to minimise the ecological footprint. Lectures on ecology, holistic and sustainable life concepts such as permaculture and other forms of organic farming can be visited in the so-called „Liminal Village“. Interdisciplinary approaches and intercultural learning are central elements. The whole festival – and it’s with the Ozora festival the biggest Psytrance festival in the world – seems to be a mix of the old hippie dream of a new society, an alternative university and an arts and culture event with the intellectual housing of a holistic future age.